The rustic bedroom of your dreams isn't far away when you add this bed. This bed features two drawer footboard storage perfect for keeping blankets and extra pillows safe. The molding detail in the headboard is accentuated by the rich finish that captures the natural grain of the wood beautifully. 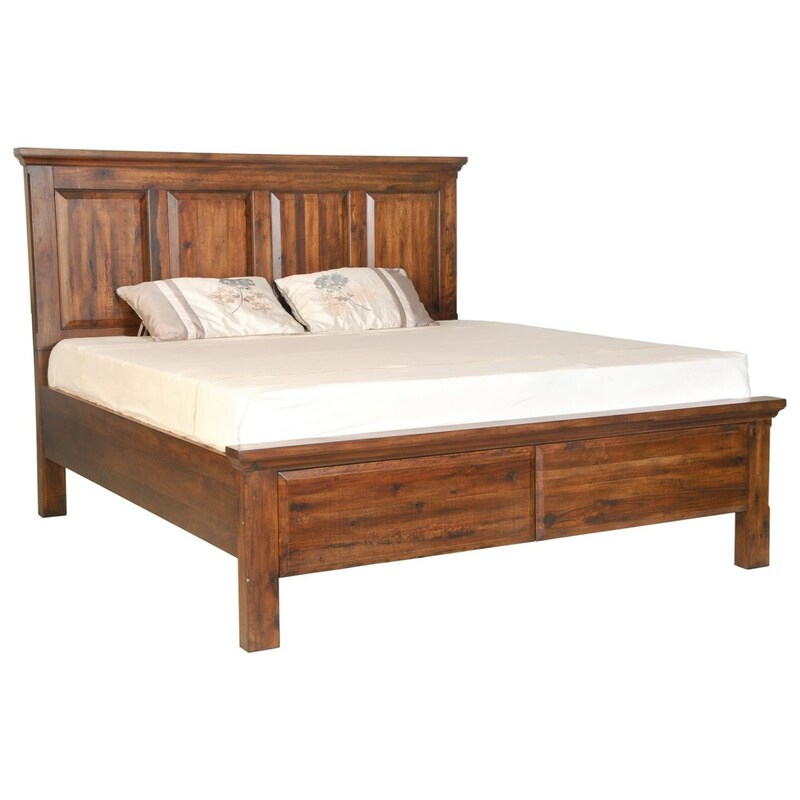 Manufactured of solid wood using mortise and tenon construction, this bed promises quality for years to come. The Hill Crest Rustic King Bed with Footboard Storage by Napa Furniture Designs at Zak's Home in the Tri-Cities, Johnson City, Tennessee area. Product availability may vary. Contact us for the most current availability on this product. Finish Pieces are finished with a seventeen step hand sanded, hand rubbed, and hand stained process producing a deep rich grain quality finish. Drawer / Shelf Construction English dovetail drawer construction. Drawer interiors have three coats of clear finish, and are hand sanded in between each coat for smoothness. Case Construction Constructed from plantation grown, sustainable Indonesian forest hardwood. Mortise and tenon construction throughout with corner blocking and dust proofing. Invite warm, rustic charm into your bedroom with the addition of pieces in this collection. Built with a focus on quality, this furniture features solid wood construction that is dust proofed and double sealed before to prevent damage from inconsistent moisture. Finished in a rich color that captures the wood's natural grain beautifully, this collection will create an inviting atmosphere that you'll love to retreat to. The Hill Crest collection is a great option if you are looking for Rustic furniture in the Tri-Cities, Johnson City, Tennessee area. Browse other items in the Hill Crest collection from Zak's Home in the Tri-Cities, Johnson City, Tennessee area.